A comprehensive 4 day package to explore Peter the Great’s imperial city in depth. See the ‘must-see’ highlights of Spilt Blood Cathedral, St Isaac’s Cathedral, Nevsky Prospekt and the world famous Hermitage Museum, home to over 3 million works of art! A longer stay allows you not just to soak in the atmosphere of this magical city and all its well-known highlights, but also to venture out of the city to discover the summer palaces that surround St. Petersburg such as Catherine Palace and Peterhof Palace. *From prices are per person in AUD, based on twin share in low season. 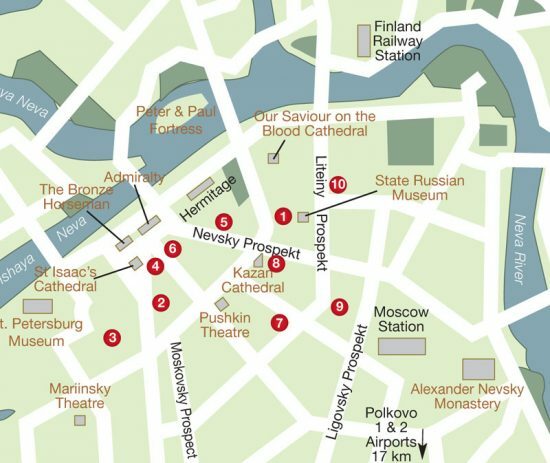 A comprehensive tour of Peter the Great’s imperial city. See the Nevsky Prospekt, Hermitage, Kazan Cathedral, St Isaac’s Cathedral and Peter & Paul Fortress, site of the city’s first settlement. Combine a comprehensive tour of St. Petersburg with Peter & Paul Fortress, the site of the city’s first settlement and the impressive Spilt Blood Cathedral. A complete city tour covering all the major highlights including Peter & Paul Fortress, Spilt Blood Cathedral with its 7,000sqm of mosaics and the gold-domed St. Isaac’s Cathedral. Tour the renowned Hermitage Museum, located in the former Winter Palace, with its astonishing collection of pre-historic, Egyptian, Oriental and European art. Tour does not include hotel transfers. Extend your tour of the Hermitage Museum to include one of two special exhibits: The Gold Room with its magnificent collection of golden artefacts; or The Diamond Room showing the development of the diamond craft over the centuries. Tour does not include hotel transfers. An extensive tour of this 18th century mansion, with its world renowned art collection, and its Rasputin Exhibition detailing the monk’s life and infamous murder. Tour does not include hotel transfers. St. Petersburg is known as the “Venice of the North.” View the city’s stunning architecture from a different perspective, on its major canals and Neva River. Tour does not include hotel transfers. Peter the Great’s grand summer palace on the Gulf of Finland. Discover its lavishly furnished staterooms and take a walk through the gardens to the gold fountains of the Grand Cascade. Catherine Palace, a massive, baroque palace set in vast European-style gardens, with an ornate façade nearly 300 metres long, the palace contains the stunning Amber Room, now fully restored. Combine Catherine Palace and Pavlosk Palace, smallest of the summer palaces built by Catherine the Great, set in English-inspired gardens and still retaining its original grandeur. Enjoy a folklore show in the spectacular setting of the Nikolaevsky Palace. A varied itinerary includes classical folk songs, a Russian folk trio and an acrobatic Cossack song-and-dance group. Hotel transfers not included. Please contact Beyond Travel for more details. FREE Visa Support documentation with hotel bookings. Iconic Orient Express hotel on the Nevsky Prospekt renowned for its impressive facade. Rooms combine 19th century charm with modern luxury. Sophisticated Rocco Forte hotel overlooking St. Isaac’s Cathedral, combining traditional Russian character and modern luxury. Modern styled rooms with traditional features and oak flooring. Luxury lifestyle hotel on the Moika Embankment close to St. Isaac’s Cathedral. All guestrooms are individually designed combining style, space and comfort. A Rocco Forte property with a long tradition of offering quality and service in the heart of the city. The hotel features elegantly styled, spacious rooms with parquet floors and soft colour schemes. Boutique property situated in the very centre of St.Petersburg. The hotel’s traditional architecture is complemented by its elegant interiors and individually designed, classically furnished rooms. A great value first class hotel featuring tastefully furnished rooms with modern amenities. Ideally located close to St. Isaac’s Cathedral and Hermitage Museum. Situated on the Fontanka Embankment, this charming hotel offers well-appointed rooms with exposed wooden beams and brickwork for added character. Basic, clean and comfortable hotel offering an inexpensive stay in the heart of St. Petersburg, very well located just behind Kazan Cathedral. A renovated hotel located just off the Nevsky Prospekt. This budget property emphasises the classic style and atmosphere of historic St. Petersburg. Small, tourist class hotel offering comfortable, well appointed rooms and a cosy atmosphere. Located 15 minutes walk to the city’s main attractions.